“Ask Now – Babies and Kids Can’t Wait” roadmap trifold brochure in English adapted by Spokane County. Based on information from the Centers for Disease Control and the American Academy of Pediatrics. “Ask Now- Babies Can’t Wait” roadmap adapted from Spokane version by Snohomish County in English and translated into Arabic, Chinese (traditional), Khmer, Korean, Russian, Spanish and Vietnamese. Translation paid for by Early Learning Division, Snohomish County and arranged by Snohomish County Early Intervention Program. 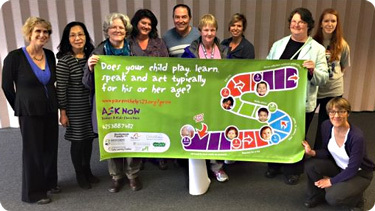 “Ask Now – Babies Can’t Wait” 6 foot long banner with Snohomish CAM partners logos for use at resource fairs, adapted from Spokane County bus ad by Snohomish Health District. Clark County developed a brochure to explain developmental screening and early intervention to families “Early Screening and Intervention for Developmental Delay is Key to Helping Your Child Reach Their Maximum Potential” — click on this printable brochure pdf for more information. An Early Identification of Autism Provider Roadmap highlights early signs of autism versus normal child development. It also highlights diagnostic criteria, screening and surveillance for autism. The School Medical Autism Review Team (SMART) engages school and medical professionals in a team setting to review a child’s needs and to ensure appropriate services that can support their success in school and life. These tools were developed and piloted by members of the Lewis County Autism Coalition (Read more). The Skagit County Autism Partnerships facilitated a focus group attended by 7 doctors from around the county. The purpose of this focus group was to identify ways to improve communication between county-wide service providers (B-3, OT, Speech, School Districts) and medical providers in Skagit County. The Lewis County Autism Coalition has developed several tools as part of their CAM work. See the Coalition’s website for more detail on their site. This section includes useful templates to use in your community if you are planning a facilitated CAM discussion. The WA State CAM Contacts document lists the key contacts and top priorities for each of the nine Community Asset Mapping communities. Birth to 5: Watch Me Thrive! Launch of the federal multi-agency initiative, Birth to 5: Watch Me Thrive! brings attention and resources to early detection of children at risk for adverse developmental and behavioral outcomes. Visit Watch Me Thrive! for more information. Website: Community Tool Box This free on-line resource connects community coalitions with practical information to assess, plan, act, evaluate, and sustain their efforts. Grant opportunities: Communities have been energized through collaboration with Wendy Stone, PhD. and director of the UW READi Lab. Through funding from Dr. Stone’s ASAP! Grant, local medical and early childhood providers have been trained on improving diagnosis in young children with the use of the Screening Tool for Autism in Toddlers (STAT). In addition, early childhood providers and parents have received training in an early intervention technique to assist young children with autism called Reciprocal Imitation Training (RIT). For more information, go to active studies.